Even by the rowdy standards of a colonial muster, a muster day murder was unusual. Colonial era musters were militia training days. The militia members would gather from a region in a field or town square and practice their drills. Depending upon the current state of relations with the local Indians, the militia took the muster more or less seriously. The officers would inventory the stock and sign up new men. A carnival atmosphere accompanied the military drills. People played games, ate sweets and drank alcohol, often to great excess. In 1748, muster was called at the home of Lieutenant Joseph Rew in Farmington, Conn. Rew, a well-respected member of the community, served as executor of several estates, according to Connecticut probate records. The muster at Rew's house involved about 20 men in the militia company. But what had probably started out as a serious training devolved into roughhousing late in the day. The men, among other things, began throwing beehives at each other. Samuel Woodruff, a young man of about 25, made his way toward Lieutenant Rew's house, perhaps to escape the rowdiness in the field. Woodruff came from a large Farmington family. His father, Samuel, served as an ensign in the local militia, a fairly low-level officer's rank. As young Samuel approached the house, rowdy militiamen waylaid him. Then they struck him in the back of the head with an old broomstick. Samuel turned and threw the broomstick toward the crowd of young men. Josiah Northaway of Farmington, about 24 years old, was the unlucky target of the stick. The broomstick had struck Northaway in the back of the head hard enough to fracture his skull. Josiah Northaway lived on for roughly four months, but he never recovered. Two doctors came to the Northaway house to examine Josiah. He had bled profusely, and he had a hole in his skull one-third of an inch in diameter. When the doctors examined his brain they discover it had received a major injury. They determined that caused Josiah Northaway's death. An inquest was then scheduled for February of 1749 to hear the case in Hartford. Four members of the militia testified as to the day's events, and their stories all supported each other. They told about the roughhousing, how Woodruff got hit with a stick and how he threw it back at the militia. 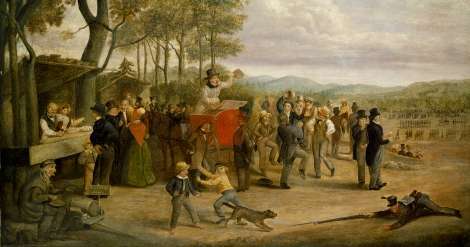 However, the witnesses testified, the militiamen had struck Woodruff in the spirit of fun. No one held any malice toward him. Likewise, they said, Woodruff had tossed the stick that hit Northaway in the same spirit. The inquest finally ruled the muster day murder accidental. This story about the muster day murder was updated in 2019.